“Designed for whatever and wherever life wants you to cook. Designed for life.” —Finex Cast Iron Cookware Co.
Crafted by hand, twelve hands in fact, each Finex cast iron skillet or grill takes about 12 hours to make and is backed by their Good Forever guarantee. And when they are complete, they offer a sturdy, uniquely classic design that will last a lifetime in your kitchen set of tools. Made for use on the stovetop or on the grill outside, as you can see from their Instagram images above, cook anything your culinary imagination and appetite craves and desires. Based in Portland, Oregon, Finex is offering a giveaway of one of their cast iron skillets to a lucky TSLL reader. Upon being chosen at random, the lucky winner will get to choose the size (8″, 10″, 12″) as well as the style (a skillet or a grill). The giveaway entry period has now closed. The winner will be notified in the next 24 hours. Thank you to all who entered. Enter by Sunday January 7th (noon Pacific time) by simply leaving a comment below on this post with your email address as a means to reach you should you be chosen. With a variety of recipes shared on their website, peruse options from savory to sweet and how to best utilize their cookware. 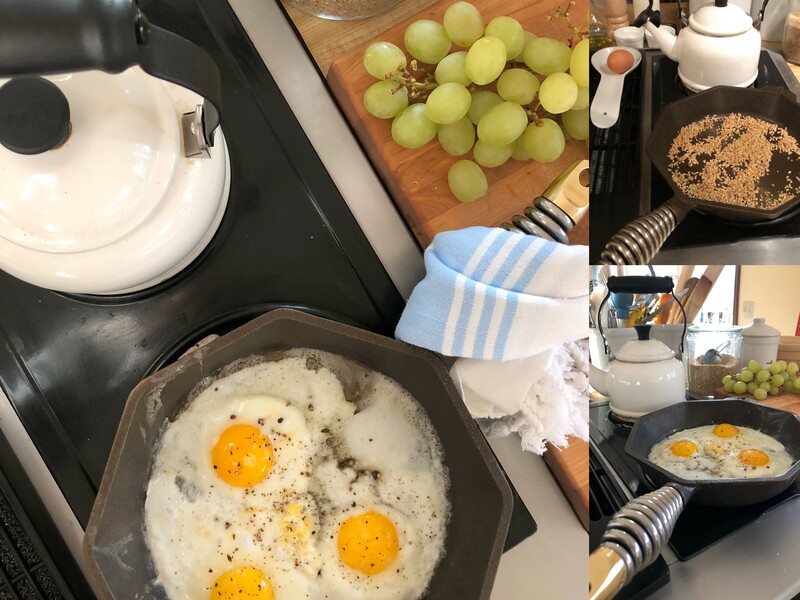 Upon using their 10″ skillet which is one of their most popular designs, I immediately began making what I always enjoy in the mornings: eggs and steel cut oats (see images below). Simple, beautiful and well made, I am excited to welcome Finex cookware into my kitchen, and I think you will be as well. Readers have been asking a great question. Are Finex skillets pre-seasoned and I have some very good news to share: Yes, FINEX pans are pre-seasoned with organic flaxseed oil. This also makes them gluten-free unlike most conventionally pre-seasoned cookware. ~Full Disclosure: Finex sponsored the giveaway and the skillet given to me; however, my thoughts and opinions about the product are my own. Would love to welcome them into my kitchen! Keep up the great work with SLL- your blog and IG are my faves! Love cooking with cast iron. Cure them well and they will last a lifetime. I would love a new cast iron pan. They are so useful. I cook eggs every morning in my Mother’s 8″ cast iron pan. LOVE it! I gave one as a gift & would love to have my own! Oh, how I would LOVE a Finix skillet !! I want to make the cast iron salsa verde! This looks very interesting! Would love to win! Thanks for the opportunity! I would love to cook with such beautiful cast iron! OHHHHHH I’d love to try it out! I love cast iron’s versatility! Use it daily, treat it well and bequeath it in your Will. A great gift for a student who wants to cook! Thank you for the opportunity to enter to win the cast iron skillet. I enjoy your podcasts very much and notice an increasing interest in the natural way of life. Me too. Happy new year. Would love this for my new home! Oh my! Clever, outstanding design. Yes please!!!!!!! I cook with cast iron and would love to use these in my kitchen. Thank you for the give away. Nice way to start a new year. Happy 2018. Would love to be able to cook with one of these pans. Even just cooking with something designed so beautifully as this would certainly make life a little more luxurious. Always been curious about cast iron skillets, they sound wonderful! My grandmother had a cast-iron skillet she used all the time – she called it the Spider. I miss her. I would love to win a new skillet! I have been thinking about adding cast iron to my kitchen. What a welcome addition to my cookware! Happy New Year, Shannon. Thank you so much for introducing this cookware and for your conversation with Jamie Cat Callan. This skillet is so unusual. I usually use my grandmother’s cast iron from Lodge. This would be a fascinating addition. I have been listening to Alice Waters and this would make a wonderful new addition to my kitchen and new found appreciation of delicious cooking. What a prize to have in my kitchen! Thank you for introducing me to this company! Thanks for sharing information about Finex!I would love to try one of those skillets! Our grandmothers knew best – caste iron is the best stove top skillets ever created. Large or small, they are indispensable for the daily cook. And since it is the New Year and we have made that resolution to drive past the drive-thru and be our own chef, what better way to set this in motion? Thank you for this opportunity to win! Cooking in a cast iron skillet makes all the difference. Happy New Year! Thank you for your blog, I enjoy reading it each week. Excited for the opportunity to win one of these skillets. That is the best looking cast iron skillet I have ever see. I love the handle design and shape. I also appreciate the fact they make it to last a lifetime and does not feed into a disposable society. Keeping my fingers crossed to be a lucky winner!! I too appreciate the commitment to quality. An investment initially, but far less expensive in so many ways. This is such a generous offer! Thank you so much! These lovely pieces stand the test of time. Happy New Year, Shannon! What a unique cast iron pan – never seen one with that geometric shape and handle before. Thanks for the giveaway. Keeping my fingers crossed. Happy New Year Shannon. I would love to have this skillet in my kitchen. I would love to be the winner of this skillet! Thanks Shannon. Sounds like a great cast iron! The cast iron skillet looks like a piece of art. I would love to use and admire it while cooking in my kitchen! We are in the process of remodeling our kitchen and this would make a great addition! This looks look a timeless piece, one I could cook in for years and then pass down to my daughter. Thank you, Shannon. it is so beautiful, what a fun pan! would be nice to play around in the kitchen with this! It would be a welcome addition to my kitchen! I use cast iron for almost everything! I would love to try this beautiful Finex! I love the artisanal aspect of these pans, because as well as being functional, they are visually stunning. and, of course, they’re made in the USA. The things I could imagine myself whipping up with one of these babies is endless…. This is the skillet I’ve been looking for! Cook for a large family and have tried other cast iron skillets that di not work. If I don’t win I’ll buy one! Happy 2018, Shannon! Thank you for your beautiful blog. I never miss a post! I highly value heirloom quality cookware and this definitely meets that criteria. Would love to add to my kitchen. Thank you for the opportunity! I have been in search of interesting cast iron cookware and this is perfect!! Beautiful. I’ve always wanted a cast iron skillet. Looks like a beautiful one! Love cooking with a cast iron skillet. Would love to add my own skillet to the hand-me-down collection I have! I love our blog – I’ve tried many of the products you’ve reviewed, made the recipes, read a lot of the books, and absorbed the movies, TV, etc. I cite yours as a great example of a successful blog and look forward to another year!!! Happy 2018!!! Spending the day planning out the coming year with tools from Shannon, as I have done the last several years. Planner pages, inspiration, and recommended readings are here by my side. My special day each year. It would be great to have this beautiful skillet as a tool to use in meeting our healthy eating goals! New Year, new life, new pan….would love this! Yes, please. Would love the skillet, cast iron is supposed to be the best. Cast iron pans are the best, a wonderful tool in the kitchen. Cast iron is the best, but not always the prettiest. These Finex pans are elegant! I’d love to own one. Love cast iron and would welcome in my kitchen. Happy New Year Shannon. WIshing us all good health, peace and love for 2018. I’m 74 years old, been cookin with cast iron, for a long time, wouldn’t mind having a new pan. Happy New Year! I always enjoy the Francophile inspiration. Love the fine. Cast iron skillet, thanks for chance to win! I’ve seen these before. Lovely and covetworthy! Happy 2018 to you, Shannon. Bonne Année, Shannon. What a lovely cast iron pan. This piece would be a great addition to my collection. Would give it a front and center spot on the wall. I’m sure it would be a great conversation starter on our Cub Scout camping trips. Finex pans are like something you wpuld see at MOMA– a unique mix of elegant, modern and rustic. A true conversation piece. And cast iron cooking just makes everything taste richer, more delicious. How proud and delighted I would be to serve a meal with this gorgeous American cookware on my table! Loved this episode! Would love to give the skillet a try! I have been eyeing this lovely cookware for a few weeks and would love to try it out! Happy New Year! Such a beautifully crafted pan. Thank you for the opportunity to enter to win one. Bring it to the hills . Grew up with my mom using cast iron skillets, I think that’s what is missing from my cooking. Cooked with Lodge for years. I am interested in comparing. Interesting design compared to most skillets. Sounds amazing and my husband would love to cook on one of these!!! Can I enter for him? I love the design!! This cast iron is gorgeous!! Thanks for offering this giveaway, I’d love any of these! Never thought I would be putting elegant and cast iron in the same sentence! Love the look of this skillet! Happy New Year, Shannon! Love cast iron! Hot cornbread straight from the skillet with a little butter…yum! Are their skillets preseasoned? Great question – I will look into that. This would be such a fantastic addition to my small set of cookware! I know what I might request as a birthday present if I don’t win! This would be a great family heirloom. This skillet is “to die for”. I’ve been lusting after these finex skillets after I saw them in a cooking post a few weeks ago! They are so beautifully made. I would love one of these skillets. I’ve been wanting to try some other cast iron. Someone has to be making it better than Lodge. Would be a lovely piece to add to my cookware. Absolutely love cast iron! Love all your posts and would welcome a new Finex skillet into my kitchen! This is just what we need. A lifetime cooking companion! Cast iron is the way to go! I would love to own a Finex skillet. I would love this skillet in my kitchen! Would like to have this in my kitchen.would be my first set. Love cast iron. Nice looking design. I’d love to own one. I have been eyeing these. Thanks for the opportunity to win. Cast iron is the original teflon without the toxic chemicals. I love it!!! Cast iron skillets are amazing–would love to welcome Fines into my kitchen!! Thank you for the opportunity to try your product. I scour flea markets and yard sales to find good cast pots and pans. Happy New Year!! Have cooked with cast iron many times . I’m teaching my niece how to cook and a Finex cast iron skillet would be a great tool to use. I lost my favorite cast iron in a move. I would love to win this Finix. Happy 2018 to you and the pups! I love this. A true heirloom! Good observation. They truly are sturdy to say the least (in the best possible way). Love cooking with cast iron and these appear to be works of art as well as great kitchen utensil. Yes please, I would love to use. I bought myself an enameled cast iron Dutch oven for Christmas, and am ready to jump even further on the cast iron train! Beautiful skillet, would use this to death. Cast iron gets better with age and usage. I have been lusting after Finex for years! Good cast iron skillets are just like good friendships–treat them well and they will last a lifetime and get better with age! Cooking with cast iron makes food taste and look better than any other method! My family simply loves cast iron skillets–I’m a singer/songeriter and I even wrote a song about them! Oh, I really do need a skillet. This one sounds great! I’m using my mother and grandmother cast iron. Some of it is very old. I have one pan from the 1800’s. Would love to add another piece to what I have. This is an amazing giveaway, who doesn’t want a Finex cast iron skillet. Thank you..
I’ve been eying up these pans for a couple months now after discovering them! I would live a finex skillet! They are such a beautiful piece of cookware! I love my trusty lodge but this looks like an upgrade for sure. I would live to try this thing out. My husband wants one because he is obsessed with cast iron, but we have no more room in our kitchen. The cast iron pan looks wonderful. I would love to make dutch baby pancakes for weekend breakfasts for the whole family. Would love to make some salmon and lentils in a new cast iron skillet this year! Happy New Year🎉Thank you for this give away. I’ve been wanted to try a cast iron skillet for a long time but never had the corsage to go out and actually buy one. I use my cheapo cast pans all the time. I would love to see what the good stuff has to offer. I have a goal of using just cast iron in my kitchen. Cast iron is the best! Love Finex! Good luck to everyone. Love the few cast irons I have now. Would enjoy another. These are amazing skillets. I would really like one. What beautiful craftsmanship! I love cooking in pretty vessels! I could always use a new cast skillet! With Finex, it looks like I’ll be starting over building my cast iron cookware set. This would be an amazing addition to my cookware. I’m currently obsessed with cast iron, this model looks amazing! I had no idea such a beautiful cast iron skillet existed. I think I will buy one even if I don’t win. Excellent! One of my earliest kitchen memories is my mother cooking with her cast iron skillet! Thankful for this chance to win one! I love cast iron skillets! I have one that I inherited from my mother in law after she passed and it is a joy to cook with! I love how you can go from stove top to oven. It’s so versatile! Thank you for the chance! I’ve been looking to add a new cast iron skillet to my kitchen. Winning would be a great way to kick off a new year of cooking! I’ve been drooling over a Finex for a long time. A very beautiful piece of cast iron! Had my eye on these skillets for a while now. Would love to win one! This is truly an amazing opportunity. Count me in. Cast iron is THE best ! I LOVE cast iron, these look amazing! Woo-hoo!!! I would LOVE to win this cast-iron skillet. I truly enjoy cooking. My mother has always used a cast-iron & I would surely follow in her footsteps. Curious to see how those oats turned out! Thanks for the giveaway. I love cast iron. I have several pieces that I use many times throughout the week (including an oversized skillet that I inherited from my grandmother that is over 80 years old!) and would love to add a piece from Finex to the mix. Thank you for this chance, and especially thank you for all the hard work you do on the blog and the podcast. I am a huge fan of cast iron cookware! I have pretty much transitioned to using cast iron exclusively in my kitchen, and I am always looking to expand my set with unique quality cast iron. If I win, I’m going to get the 10-inch skillet! Would love to own it….it’s a beauty! We only use cast iron griddles, dutch ovens and pans.I have some 4th generation irons.We would love to give this one a work out! A Finex skillet would be awesome. I would LOVE to cook brunch with these! Just beautifully crafted. Looks and sound like a great lifelong product! Thanks for the awesome giveaway, Shannon! I use cast iron on a regular basis and love how it cooks. The pieces I own don’t hold a candle to the Finex cast iron though. If I’m blessed to receive such a beautiful skillet, it will definitely be ranked first in my kitchen! Fine is definitely an heirloom quality build meant to last generations. Love the unique look as well. Much peace, love, joy and blessings to you in 2018 and thanks for the giveaway! One of these would be awesome! Such a beautiful skillet! Pretty and practical! I love cooking and entertaining. I feel most at home in my kitchen and, as strange as it may sound, have a close relationship with my cookware! I would love to start adding Finex to my kitchen. I use 60-70 year old BSR, Griswold pans. I have read some good reviews on Finex and would love to have one to add to 20 pan-pot collection. These pans look amazing!! I cook so much with my current cast iron, and just inherited my husband’s great grandmother’s 11″!! Love cooking with cast iron! Cooking with cast iron is life! Just in case this is open internationally! Would love to add one of these to my working collection of cast iron skillet! I just found your company. I’d love to see how your product compares to what I already use. This would be a great way to start the new year! Thx for the great opportunity! I finally got the courage and purchased my first cast iron in 2017! Would definitely love to win one of your skillets especially since our new home will have a gas stove. I love cast iron! I would be elated to win this set! What a wonderful giveaway! When my mother was forced to leave her home and I had the task of cleaning out her home, in haste I gave away her mothers cast iron skillet. To this very day I have regretted that action and wondered how, how, how I could have done such a thing. So many memories went with that skillet. I would love to have the opportunity to own another one that possibly I can pass on to my children. Great looking cast iron cookware! Greatly enjoyed today’s podcast to begin the new year. I would love a cast iron skillet to add to my kitchen tools. I miss my cast iron skillet! Love your blog, loved your podcast! Would love a new cast iron skillet! Happy New Year’s to you! Cast iron, the original no nonsense cook ware. Treat it with love and your rewards are endless. Anyone who already cooks on cast iron KNOWS what a pleasure it is. What a great giveaway! Being fromportland area, I really enjoy supporting local makers, and since I recently started replacing all my cookware with cast iron, this pan would find its place in my kitchen and will be used often. Also thank you Shannon for your podcast, it’s almost meditative to listen to your voice and learn to be present, calm, collected. Super for supper! Love love love cast iron! Pans look awesome! Great write up! This would make a great presentation for our favorite cast iron cornbread. Yes, cast iron is a great asset in the kitchen. Would love to win it. Would love to incorporate this into my cast iron collection! Wonderful podcast! Would love to have this cast iron skillet in my kitchen! I was just looking to buy a 10″ cast iron skillet, this one looks pretty sweet. What a treat to add this to my kitchen!!! Oui – je l’aime le finex aussi! Great contest! Would love to try these fancy cast irons in my kitchen! Would love to give a Finex cast iron skillet to my daughter, Julie, who lives in Portland AND who just told me at Christmas that she is having my first grandbaby in July!!!!! Congratulations Charity (and to your daughter as well 😉). I would love to add the 10” finex skillet to my new kitchen! Would love to add Finex to my collection! Beautiful cookware, that I would love to own! Thanks! I’ve been meaning to up my cookware style, and looking for a cast iron skillet to begin with. This would be the perfect start for the new year, and my new goals of making more meals at home. New year – new utensils! I have not cooked with a skillet like this. I seem to be seeing skillets like this about and they seem to help make fabulous meals. What beautiful, quality cast iron! Thanks for sharing! 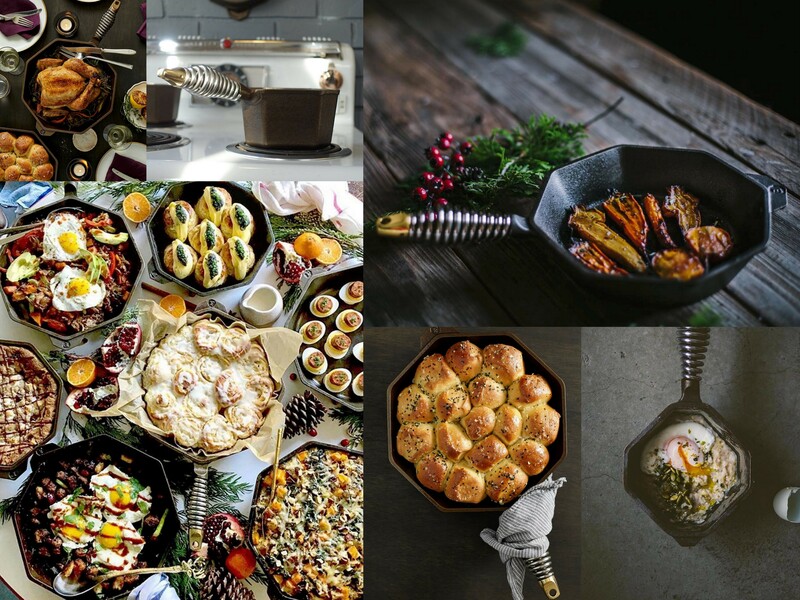 Beautiful and functional….would love to cook with this skillet! Perfect time of year to use this skillet! I have heard nothing but great things about Finex and have been eying them for a while. I currently use Lodge, but the design of Finex is so nice! Love the shape and style of this skillet! A great addition to any kitchen! Also, I very much enjoy the Simple Sophisticate newsletter and podcast! Happy New Year!! Functional yet beautiful. Would love to own one to cook a petit dejeuner in! Having grown up in the Southern US, I took for granted that all cast iron skillets were the same. Thank you for introducing me to a way of enjoying my Southern recipes in such a unique and beautiful way. The Finex looks like a great addition to a cook’s toolbox! Enjoyed your chat with Jamie today! Delightful! This cast iron skillet would stand the test of time! I’m now adding pieces that I won’t need to replace. This would definitely be one of them. This would add a definite touch of luxury to any kitchen! Thank you for this opportunity! Love the podcast. cast iron c’ est sympa! Love cast iron – thanks for the opportunity to win! The one item I didn’t get from my Christmas List-A cast iron skillet! I promise I was a good girl last year. Thank you. My mom had a cast iron skillet for years….only frying pan she owned! Modern stainless steel gleamed over my eyes and into my kitchen, but often wondered why I never owned one! I would live the grill skillet or the small cast iron. I use my larger on to sear meats. Love! A fresh new iron skillet to start a fresh and healthy new year! This reminds me of the tools my grandmother used down South. Please enter me. Would love and appreciate having the grill skillet or the cast iron in my kitchen repertoire. My grandmother cooked using cast iron and she always made the most with what she had. Thank you for the article and for a chance at ownership! Merci Beaucoup. Maybe this would help me be a better cook! Love cast iron cooking. Thank you for giveaway. I am a major fan of cast iron, and I cook in some form of it almost every day. I have all my late grandmother’s skillets/griddles–such a treasure! I’ve never heard of Finex, but the pieces in the photo above are gorgeous. Thank you for the give-away opportunity and the link to recipes. Happy 2018! I love cast iron but had to throw my last one out as it was so rusty (no really way too rusty when my kitchen was remodeled because of damage from an ice storm…) it had gotten buried in the clutter that was moved from the kitchen to the garage and when i found it a year later ugh! I miss making stew in it most. So I do hope to win. Thank you. This looks like an awesome cast iron! We recently moved and the box that had my crock pot and cast iron were lost or thrown away by accident. The agony! What a gorgeous design these cast iron pans have! Happy New Year to you! Thanks for the terrific give-away! You’ve made me very curious! I’ve never known of being seasoned w/flaxseed oil;brilliant!! Also eager to explore the variety of uses from desserts to grilling. This truly follows “Simply Luxurious “ Living. Cast iron is great. I will definitely check out the company. Thanks for the introduction. Renniks594@msn.com. could always use a new skillet! What a gorgeous design, I would love to add one to my family heirloom cast iron collection. Thank you for introducing me to this USA made company! Happy New Year! Yes please! I love your podcasts and all that you do. Listening to my heart thrum! I have been looking for a good cast iron skillet! This one looks amazing! Would love the chance to cook with it! I would love to have this pan! I love cast iron! I want to make the switch from non-stick to cast iron – this would be great! I am banishing stainless steel from my kitchen-one pot at a time. I now have Lodge cast iron, but would love to try this pan! Cast iron is oh-so-wonderful! You can bake in it, fry in it, steam in it and other than being heavy, it is so easy and versatile. It also gives you the benefit of extra iron in your dishes! And I love the shape of this pan; an octagon! I hope it’s an international giveaway. Organic Flaxseed oil to seal it? HMM. Would sure love to try this pan! I have been pining for a cast iron skillet. This is the perfect size. I am hoping to be the lucky winner! Lovely interview today Shannon, thank you for bring it to us. There were so many good points, I will listen to it again to be sure to savor all the ideas. Happy New Year to my kindred spirit in Bend! Finex sounds lovely and I would very much enjoy trying out a skillet! I have read and heard so much about cast iron cooking and would love to try it. Finex sounds like a high quality skillet and I would be honored to use it. I never thought I’d describe cookware as a work of art but this pan surely is. How gorgeous! Thank you to Finex for sponsoring the giveaway and to Shannon for introducing me to a new company! My dad has been using a cast iron skillet for years and swears by it. I love the honeycomb shape of these pans which is such a beautiful and unique take on a utilitarian object. So artistic and functional! The skillets are such an interesting design. Would love to have one. Thanks for the give away. A gorgeous cast iron skillet! I’ve been looking or just the right one and this seems to fit the bill–I NEED this in my life! Beautiful cast iron skillet. I would love one! I use a 10 inch cast iron skillet daily, but have been dreaming of a 12 inch skillet. What a beautiful cast iron skillet! And seasoned as well – WOW! This will be a perfect addition to my kitchen. Thank you so much for the opportunity to win. As a young girl growing up in the Southern part of the US, I watched my grandmothers and mother cook in cast iron at least once a day. These pans become better with age and use, and in fact, many families consider them an heirloom to pass down. I would love to welcome this beautiful cast iron skillet into my own kitchen. From my great great grandmother to my mother-cast iron was used daily. It’s time for me to join the tradition. Oooh la la! Would love this addition to my kitchen. Thank you for the opportunity. Also love listening to your podcast! Oh my goodness! It’s a piece of art, as well as a necessary piece to have in the kitchen. It’s the right tool for a lot of jobs. Having one this size would be amazing. I’ve heard nothing but good things about Finex and their products. I’d love to add one to my collection. These guys make a great product, and I’ve had had my eye on them for years. Thank you for running a promo like this. I’ve been following them and have heard great things about their cast iron skillets. Would absolutely love to win one! It’ll be a huge bonus if I can add this skillet to my la petite cuisine. I would definitely use it to bake my sourdough bread besides using it on stovetop. Kitchenware should be multi-functional like this! Ooh love the look of this! Such a unique shape! Wow~ didn’t know cast iron could be different. Thanks for all the great inspiration, Shannon. This is lovely! I have always wanted to try cast iron. Thank you for the giveaway! Gorgeous Pan! I’ve never heard of Finex before — thanks for introducing me!